As some of you know, I just spent a week with my brother John on the USS John C. Stennis, an aircraft carrier on which he serves in the US Navy. While I was on this trip, I kept a kind of diary, and I will reproduce some of it here over the next several days, so you know what it was like, the stuff I did, etc. On June 29th I got out of bed at 0315 and threw my clothes on. I picked up my bags and headed out the door. It took about 45 minutes to get to the airport and I parked in the “economy” section. The sign said that the “economy” was that I only had to pay $7 a day to park there. Doing some quick math, I figured that my 10 day trip would cost me $70. Yikes. Later on that day when I talked to Kim, I informed her of this and asked if she and her dad could drive to the airport and get my car in order to save us $63. They did. I checked in at the airport and paid the $20 fee for having luggage (how dare I!). I am seriously considering only flying Southwest from this point on, because they don’t gouge you with the extra fees. The flight to Chicago was uneventful, and an hour long. I sat next to some guy who wouldn’t even look at me for the entire flight. The flight to Seattle was better, since it was a bigger plane, and I sat between a young man in the Army ROTC and a Swedish flight attendant. Actually, she was Norwegian, but she works for some Swedish airline. Anyway, I spent most of the time reading, watching the in-flight movie (“New In Town” with Renee Zellweger), and talking to the Army guy. I picked up my bag at SeaTac and called James (my Bro-in-law) because he was supposed to pick me up. He drove me to Everett where they live and showed me around. The Stennis was in port, so we drove by the base to get my first look at her. Then we got KFC and went back to their apartment. We spent the night eating barbecued meat (chicken and pork) that my sister Beth made and watching different funny videos on youtube. I was pretty exhausted (I had only gotten 4 hours of sleep the night before, and it was now 2300 Pacific time, which is 0200 Eastern), so I went to bed. I woke up on the 30th at 10am and took a shower. We sat around for a few hours and then left for Seattle. John drives using the “pulse” method. This means that he eschews the cruise, and his speed fluctuates within 5mph. Kim laughed when I told her that, since she says I do the same thing. Yeah, but that’s just because the cruise doesn’t work on my car. We went to the Pike Street Market and watched the fish throwers, did some window shopping, and ate at two places: Piroshki, and some Chinese place (I can’t remember the name) that sold these buns with meat fully encased inside the bun. We drank fruit smoothies and ate our food on the grass by a totem pole overlooking Puget Sound. The bun thing was good, but it gave me heartburn because it had onions in it. I really liked the cinnamon twist thing from the Russian place, though. I think it had orange glaze or something on it. I had to replace the batteries in my camera at lunch…we’ll see how many times this trip I have to do that. We rode the monorail to the Space Needle area. The science fiction museum had some interesting stuff, especially in the Jim Henson section, so we hit that first. 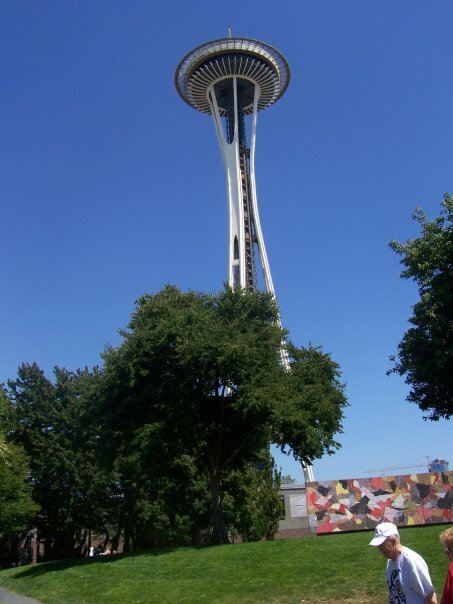 Then we walked to the space needle, and rode the elevator to the top. I took video footage of the elevator ride up, and then we took lots of pictures from the top. They had a restaurant up there, but I joked that the prices were so expensive that when the patrons get the bill, they probably want to jump off the Needle. We rode down again and went to the sushi place called Nijo Sushi Bar & Grill. John ordered five rolls of sushi (six different kinds). I tried one of each of the six types of sushi, and I didn’t throw up. Judicious application of diet coke was called for, but I didn’t throw up. . John ate all the rest of the sushi (34 pieces) and he could tell that I was still hungry (just not for sushi) so we went to an Irish pub (the Owl and Thistle or something like that) and I ate a French Dip sandwich and fries. We walked (a lot!) down the shore to Safeco field/Qwest field and took pictures. By now I had worn a hole in my left sock heel. We started walking back to the car, and tried to find a place where we could buy some socks (scratch that…A SOCK would have sufficed), but no luck. I called Kim right before we got to the car and wished her happy anniversary, since it was after midnight central time (but the sun was still up in Seattle). We got to Beth’s and I guess they had been waiting for us to get back so they were a little upset (I didn’t realize we had a curfew). Beth drove John and I to the base and we signed in. He walked me through the hangar decks aft to our berthing space, and showed me where the head was. I got a locker to put my stuff in and a rack to sleep in. The funniest part was that he had reserved a bottom rack for me, but somebody else had used it for their Tiger (all the civilians on board were called “Tigers”). He was kind of upset, but we just took the mattress and threw it on my rack (the top one out of three). After a quick trip to the head and another admonition to not go barefoot anywhere (!) I climbed into my rack and started typing. I’m curious to see how the officer spaces compare…no word on if that will happen or not. Probably won’t happen. (ed: It didn’t. But I did tour the Midway, and the racks were just a little bigger, but not much different there.) Then I went to sleep. I remember hoping that I wouldn’t roll out as I was a good six feet off the deck. I slept very fitfully, waking every hour since it was so uncomfortable. Each rack was like this: a steel plate, then a 4 inch mattress 15 years old, and then sheets, and you. I tried lying on my back, and my side. There was no good way to sleep, it’s just something you have to endure (or get used to). At about 2am the sailor who took my original rack for his tiger came in and was making all kinds of noise about how “somebody jacked my brother’s rack!” It was kind of funny, but they got it all straightened out in the morning. A very interesting day. This entry was posted in Seattle, Tiger. Bookmark the permalink.